I think we can safely assume that when Peter Pan equated wearing a tie with everything bad about growing up, he had never heard of the Tie Flask, a microfiber tie with a six-inch pouch for tucking inside the front flap and a self-sealing valve for sucking booze. Growing up may be awfuller than all the awful things that ever were, but at least you’re allowed to drink in a variety of silly ways, including from your tie, or even better: out of a sippy-cup for wine. This is it. This is why I was put on this Earth. Remember in Superman when Kevin Costner was telling Superman he was brought to Earth for a reason? Well this is my reason. 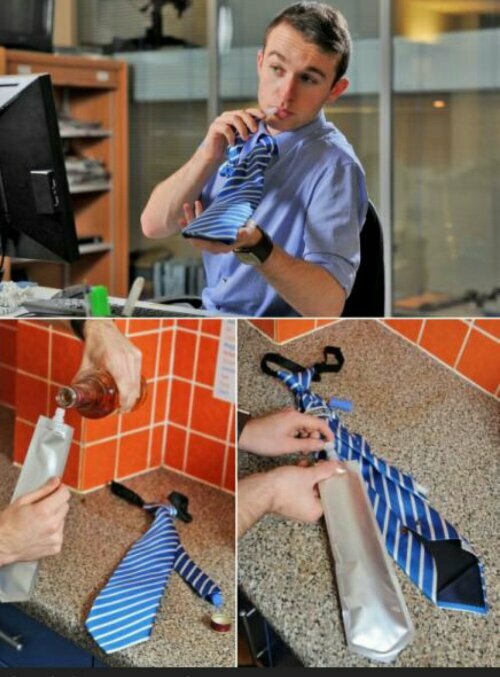 To casually drink alcohol out of my tie at work. Some people save the world, some people booze. I’m a boozer baby. P.S. There’s a link in the original article promoting a wine sippy cup. I tried this in college. So overrated it’ll make you weep. Posted on August 30, 2013, in Average Blog Posts and tagged alcohol, fashion, Kevin, liquor, Superman. Bookmark the permalink. 1 Comment.